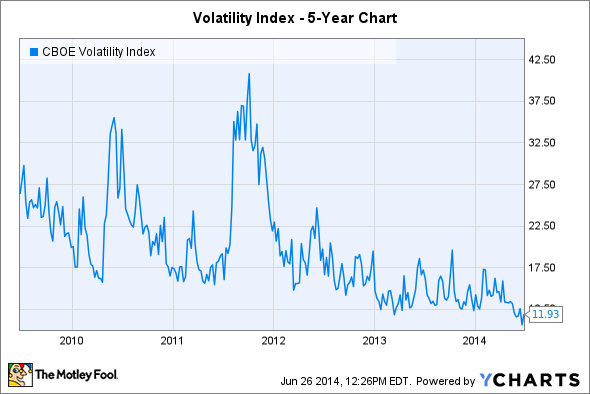 Think you're ready for volatility? Think again. The Dow Jones Industrials (DJINDICES:^DJI) was down 38 points as of 1:30 p.m. EDT, recouping much of the ground lost earlier in the day. Most market participants blamed the drop on concerns about just how quickly the Federal Reserve could raise interest rates, as well as data suggesting that consumers last month were somewhat less willing to spend than most had expected. Yet as much as news of an opening "triple-digit plunge" for the Dow Jones Industrials might inspire fear among investors, you should prepare for a future in which 200-point moves for the index become commonplace. Image source: Victor Bezrukov, commons.wikimedia.org. For years, investors have been waiting for volatility to return to the Dow Jones Industrials and other market benchmarks. Measures such as the S&P Volatility Index (VOLATILITYINDICES:^VIX) have defied expectations by remaining at rock-bottom levels, crushing investors in the iPath S&P 500 VIX ST Futures ETN (NYSEMKT:VXX) and other volatility-tracking investments. Indeed, the iPath ETN has lost almost two-thirds of its value in the past year alone as markets have defied predictions of much larger fluctuations. Yet as potential hot-button issues start to mount, a return to volatility at some point in the future seems inevitable. When it happens, you need to be ready for the consequences on your investing strategy and your overall temperament. For some guidance, turn back the clock to 2003. At that time, the market was just exiting a two-year bear plunge, with the tech bubble's burst and the Sept. 11 attacks having helped send the Dow Jones Industrials sharply lower from its highs just a few years before. Uncertainty about the war in Iraq made investors nervous about the immediate future, let alone the Dow's long-term prospects. During the first quarter of 2003, the S&P 500 (SNPINDEX:^GSPC) moved by 1% or more on almost half of all trading days. For the Nasdaq Composite, the figure was more than 55%. What's particularly remarkable about the Nasdaq figure is that it was the lowest level for 1% moves in four years, down from a peak of 85% in the second quarter of 2000. When you compare those numbers to what we've seen from the Dow Jones Industrials lately, the contrast is striking. Since the beginning of the second quarter of 2014, we've only had four 1% moves in the blue-chip index, or less than 7%. Of course, the Dow won't necessarily become as volatile as it was in 2003. But with the potential for new military conflict in Iraq, as well as other geopolitical hot spots around the world, there's no shortage of uncertainty about the future of the global economy. Even if volatility moved only part of the way back toward its former levels, 200-point single-day Dow moves could easily become a weekly occurrence -- or even happen more frequently if the aging bull market gives way to a more turbulent period for the stock market. Dow investors need to get comfortable with that now, adjusting your emotions to handle what could look like a very rocky time ahead.